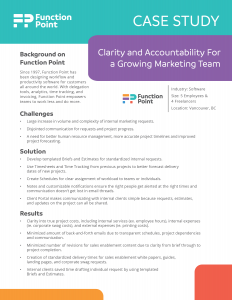 The Function Point Marketing team are guardians of the brand and responsible for articulating the values and positioning of the product to the market. As an in-house agency, we drive and execute strategies for content marketing, community management, customer acquisition, sales enablement and product marketing. Large increase in volume and complexity of internal marketing requests. Disjointed communication for requests and project progress. A need for better human resource management, more accurate project timelines and improved project forecasting. Clarity into true project costs, including internal services (ex. employee hours), internal expenses (ie. corporate swag costs), and external expenses (ie. printing costs). Minimized amount of back-and-forth emails due to transparent schedules, project dependencies and communication. Minimized number of revisions for sales enablement content due to clarity from brief through to project completion. Creation of standardized delivery times for sales enablement white papers, guides, landing pages, and corporate swag requests. Internal clients saved time drafting individual request by using templated Briefs and Estimates.